4 simple tips to help make speedy stir-fries. Forget Chinese takeout: homemade stir-fries can be whipped up in about 30 minutes, with healthy ingredients and minimal mess. As cookbook author and wok evangelist Grace Young wrote in the current issue of EatingWell Magazine, by focusing on fresh veggies and a few staple spices and sauces, stir-fries are a simple way to pack your meal with bright, zingy flavors and essential nutrients. You can make them from whatever’s in your kitchen, too: onions, frozen peas and chicken breasts? Sounds great! Celery, cherry tomatoes and green peppers? Delish! The combinations are literally endless. 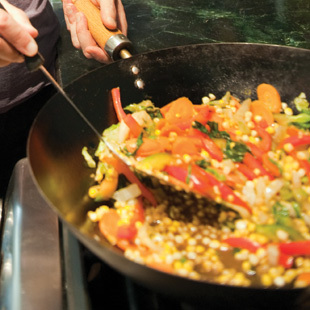 Here are a few simple tips to help make your stir-fry as speedy as it can be. Sure, frozen peas and carrots are stir-fry standbys, but beyond that, most dinners will benefit from the crisp textures and bright colors of fresh veggies. 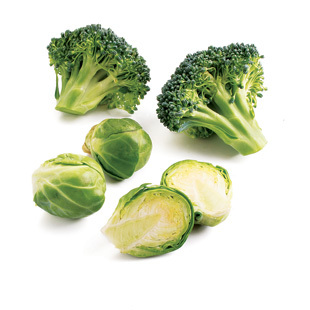 Don’t be afraid to experiment: while traditional Asian stir-fries focus on ingredients like bok choy and scallions, you can also make a great meal using brussels sprouts, parsnips and tomatoes. Once the oil is sizzling in your pan, it’s too late to worry about chopping veggies or slicing chicken breasts. You know how the hosts of cooking shows have all their ingredients in cute little ramekins? Copy that. 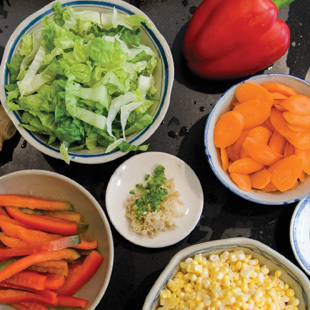 Your ingredients don’t have to be in perfect glass bowls (I tend to just pile stuff on different corners of my cutting board), but by getting every element of the stir-fry ready ahead of time, you’ll make it easier to put it together. I don’t mean to make up statistics on you, but at least 95% of burned stir-fries occur because someone is trying to slice carrots while the onions are cooking. Yeah, I know, they cost money. But they’re actually pretty cheap, and, for someone who cooks stir-fries all the time, they’re indispensable. 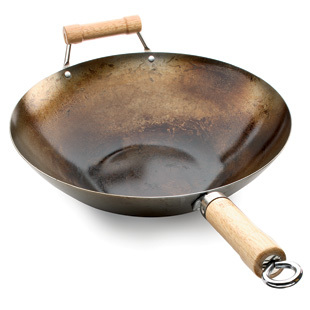 While a nonstick skillet can be made to do the job of stir-frying, a 14-inch flat-bottomed carbon-steel wok with a long wood handle can work wonders a skillet never dreamed of. Carbon steel conducts heat incredibly efficiently, and a flat-bottom wok makes more contact with the burner than a conventional one. Plus, while nonstick skillets (and woks) are unsafe at high heats, a carbon steel model can handle the intensity like a pro. Add to that the fact that a well-seasoned wok is naturally nonstick and you’ve got a recipe for using less oil. That means naturally healthier cooking! Not sold yet? Here’s one more perk: like cast iron, carbon steel actually transmits extra iron into your food. You get extra nutrients cooking this way! Remember that most of the magic of a stir-fry comes from the direct contact between your ingredients and the hot metal of your cook pan. Put more than 12 ounces of meat in a stir-fry and it’ll start to pile up, touching other ingredients rather than the pan. That means some pieces will steam rather than sear. And, trust me, no one ever asks for steamed beef.